I’m supposed to warn you away from early-90s [Famous Person’s Name] [Semicolon] [Actual Title] films, but I’m pretty sweet on this one. It’s no Mary Shelley’s Frankenstein, but New Nightmare is something we hadn’t seen for quite some time by 1994: a decent Wes Craven film. 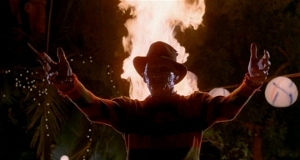 In spite of the 1988 Writer’s Strike, shoddy direction, and Fred Kreuger’s dual role as both an immortal dream monster and a lame stand-up comedian, Nightmare on Elm Street 4 managed to become the most successful film in the franchise…up to that time. It’s easy to see why. The financial successes of Parts 2 and 3 led to the most interesting phenomenon in the Slasher movie’s short history. Hard as it is for genre fans to pronounce this word without retching, Slasher movies became…ugh…mainstream. It took ten years, but these Old Testament morality plays disguised as exploitative gore fests went from urban, independent theaters to multiplexes across the U.S. and around the world. Both Friday the 13th and Nightmare on Elm Street fielded successful TV series and horror merchandising started to ramp up to levels it hadn’t achieved since the ’50s. Nowadays we can look back and see the sub-genre’s slow motion death, but 1989 was actually a rare year for the cosmopolitan horror fan who’d yet to turn their nose up at the Slasher movie. That was the year all three of the “name” Slasher franchises pushed out crap sequels. In fact, that summer saw a stupefying succession of sequels, with Indiana Jones and the Last Crusade leading the pack. Star Trek V, Ghostbusters II, Karate Kid Part III, they all followed in an attempt to derail a little Warner Brothers picture everyone had heard about that was supposed to be half-decent, called Batman. 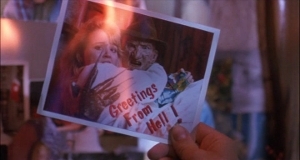 Hey, I’d buy that postcard. No matter where you are, it’d still be accurate. By this point the Nightmare films were officially on auto-pilot, each one more profitable and less sensible than its predecessor. In terms of sheer dollars, the initial trilogy of Nightmares became a living refutation of the Law of Diminishing returns. The first grossed $25 million in theaters. Freddy’s Revenge pulled in over twice that. 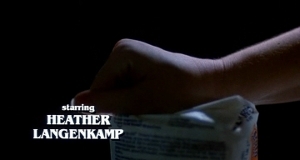 Dream Warriors broke them both, along with the bank, with an $87 million gross. Its success triggered the last great wave of Slasher movies. Most of them are rightly and truly forgotten, looked down upon even by sub-genre fans as the movies that finally ruined everything for everybody. Or, The one where they dropped the word “Part” from the title. Most of the the Slasher series that chose this route tend to go downhill rather fast. Except when they already hit their nadir (and gaydir) in Part 2. Things just had to improve after that, right? 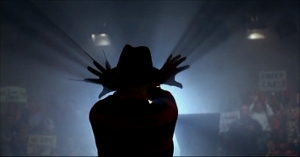 The first Nightmare on Elm Street is one of those remarkably few Slasher films where tacking on a cliffhanger ending actually worked. 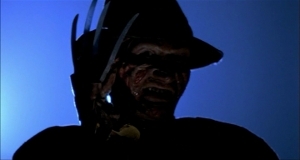 It felt like a thematically appropriate way to end that story because, as Tommy Wallace said to Laurie Strode all those years ago, “You can’t kill the bogeyman.” And what else is Fred Krueger? The 1980s were a watershed time for American movies studios. After the protracted collapse of the old studio system in the 40s and 50s necessitated a major overhaul of Hollywood’s entire production architecture, major studios spent the 60s and 70s establishing financial relationships with independent movie producers. Previously considered the lowest form of life on Earth, a rising generation of creative types proved instead that smaller films staring no one anybody had ever heard of could make major bank. All they needed as an idea, and a group of people who believed in that idea enough to see it put on screen.